Risk Integrated, the leading provider of client-specific risk systems for CRE, has run its Specialized Finance System (SFS) with the 2015 CCAR scenarios published by the Federal Reserve Board (FRB). 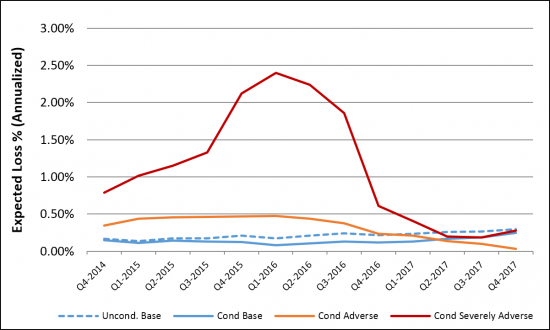 The analysis shows the base, adverse and severely adverse losses for a standard US bank’s portfolio of commercial real estate loans. Loss estimates are shown under four different sets of assumptions: the unconditional base case, the conditional base case, the conditional adverse scenario and the conditional severely adverse scenario. The unconditional base case takes the FRB’s base-case to be the central tendency for the economy, but still allows for variations in economic and market conditions. The conditional case takes the economic scenarios to be fixed, i.e., the conditional base-case gives the losses conditional on it being known that the overall economy will be benign. The SFS estimates these results using a transparent detailed cashflow simulation model. The model projects the debt servicing cascade and collateral values for the individual deals in thousands of alternative economic and market scenarios conditioned by the central forecasts and the historical volatility structures. These market conditions interact with idiosyncratic risks such as tenant defaults and re-leasing to determine whether the loan will default and if so, what will be the subsequent loss (if any). The models are completely transparent and can by customized by each client to match their markets, deal structures, available data and experience. In this case the limited data set of the FRY-14Q is used, but the model uses more detailed information per asset if it is also being used for grading and Basel capital. For more information please contact Peter.Andresen@RiskIntegrated.com or Chris.Marrison@RiskIntegrated.com.